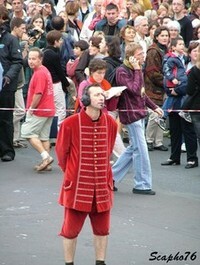 That was the French street theatre company Royal de Luxe in London last May. 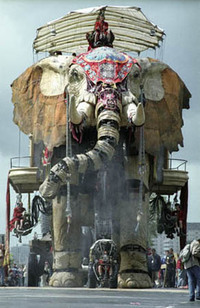 The show was The Sultan’s Elephant, created in honor of the Jules Verne centenary in 2005, and performed that year in Nantes. 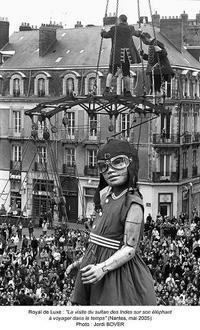 Founded in 1979 by Jean-Luc Courcoult, Royal de Luxe has since then made theatre in public spaces in Europe, Asia, Africa, and South America. 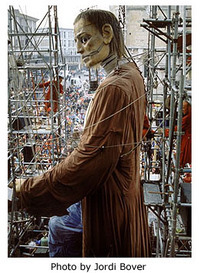 The London engagement, years in the planning by the British production company Artichoke, was the debut of the Little Girl Giant, as she has come to be called, in the English-speaking world. You could probably just make out the Elephant – at least its trunk -- hosing her down. 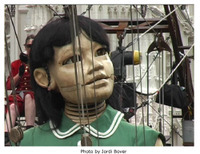 At around 20 and 40 feet high, respectively, both were designed by a longtime Royal de Luxe collaborator, Francois Delaroziere . The video, shot by Mike Connolly of Electric Pig, is by far the best document of the event on the Web, and the place to start if you cannot in person see Royal de Luxe. Les Balayeurs du Desert, a French rock band that has worked with the company since the 1980’s, provided the music. The song is “Decollage” -- their riff on “It Amazes Me” by Cy Coleman and Carolyn Leigh, the vocal sample by a digitally remixed Blossom Dearie. Thus will begin the latest chapter in a Royal de Luxe narrative that spans three continents and fifteen years, The Saga of The Giants. On that first visit to Le Havre, the story goes, the Giant was frightening to the people of the town only when he dreamt; the morning after, cars were found impaled on trees, or pinned to the asphalt with a 10-foot fork, the work of his dreams. And so, on the second night a wall of light – motley thousands of battery-operated headlights mounted on a twenty by thirty foot frame -- was erected to prevent his losing consciousness. Head dropping to his chest again and again in the painterly golden light, the Giant spent a wakeful night. A blonde singer, Peggy, wearing a long blue opera cape with a stiff collar, climbed out of a white limo and was lifted thirty feet onto the scaffolding to sing to him, the better to divert him from dreaming. Un bel di vedremo, sang Peggy, a few yards from his face, the anguished and sleepy longing she saw there finally making her turn away. On the morning of the third day, a hole had been torn in the wall of light, the immense scaffolding was torqued and knocked aside, flattening still more cars, and the Giant was gone. The Giant’s last appearance anywhere was in August, 2006, in the South of France. Looking as relaxed as his watchful countenance allows, he sat barefoot on a lounge chair anchored to the river bed by the Pont du Gard. Just as it is understood that the Little Black Giant is his son, Little Girl Giant, last seen in Chile in January, when she chased down and caged a rhinoceros, is his daughter. It is rumored she will face her father in Reykjavik in the spring, and that the meeting might not be friendly. Looking closely at her face, it’s possible to see the minute asymmetries – her nostrils do not match exactly, for instance -- and the traces of the chisel that give life to sculpture, endowing the sculpted face with the suggestion mood and variation. It ruins absolutely nothing to know that the sculpture’s changeability exists in the viewer’s imaginative appreciation of light and motion. Indeed, all art is participatory owing to a quality that art historians call “the viewer’s share”— the finding of meaning in what is seen. 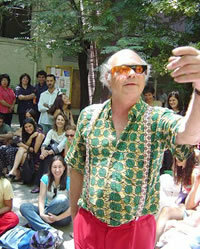 Partly, this consists in a viewer knowing or guessing the intention of the artist. She looks lonely, we might say of an image of the Virgin Annunciate, singled out, and in awe. How much we see because we know to look for it and how much an image conveys through the skill and inspiration of the artist is the mystery at the heart of imagery. Every image posits a viewer seeking meaning, and all art is -- to at least that extent -- performance.